As the singer, dressed in black with a few gold spangles and long blond tresses, introduced the theme to the audience, she remarked with a sly wink: “The irony of the day that this is the hottest day registered on February 23rd is not lost on me.” Still, she invited the packed house to join her in suspending disbelief and welcoming an evening of winter-inspired songs. The irony was only fitting: much of the album, she told the audience, had been written in Lawrence, Kansas at the height of a 95 degree summer. 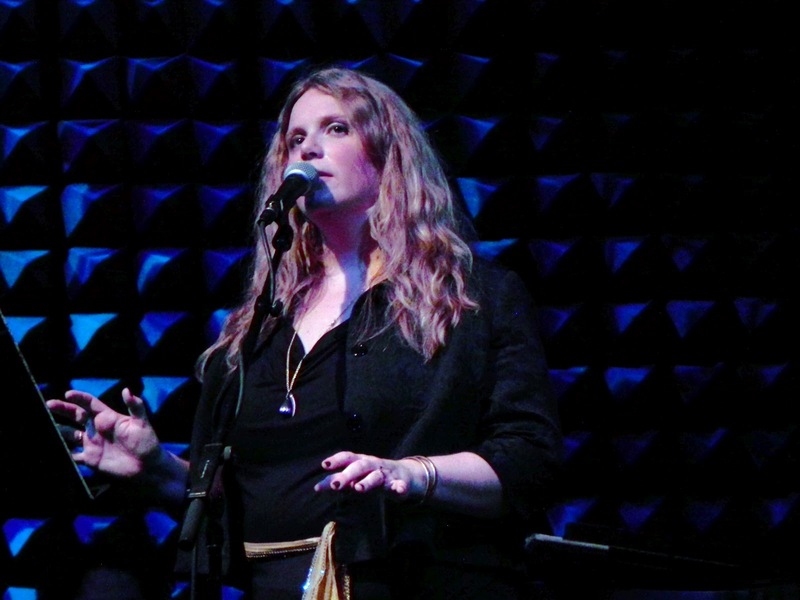 Prior to Thursday night’s performance at Joe’s Pub, I’d been fortunate to catch Ashley Davis a few nights earlier at the Irish American Writers and Artists Salon, where she performed two songs from her new album, Songs of the Celtic Winter, and I can tell you this: two songs of this singer is not enough. While her immediate talent as a vocalist is obvious, much of Ashley’s gift is to create a mood: a sustained journey into a beautiful netherworld of plaintive verses and haunting choruses, a place where traditional Irish melodies blend with classical literature and poetry to create an overall musical experience. You can try to cram that into two songs, but an evening of it is best. Pull up a chair. Have a Guinness. And ignore the rumble of the 6 train as it tunnels twenty leagues under the New York pavement. These are fireside songs, and this night with Ashley Davis was a perfect Celtic winter. 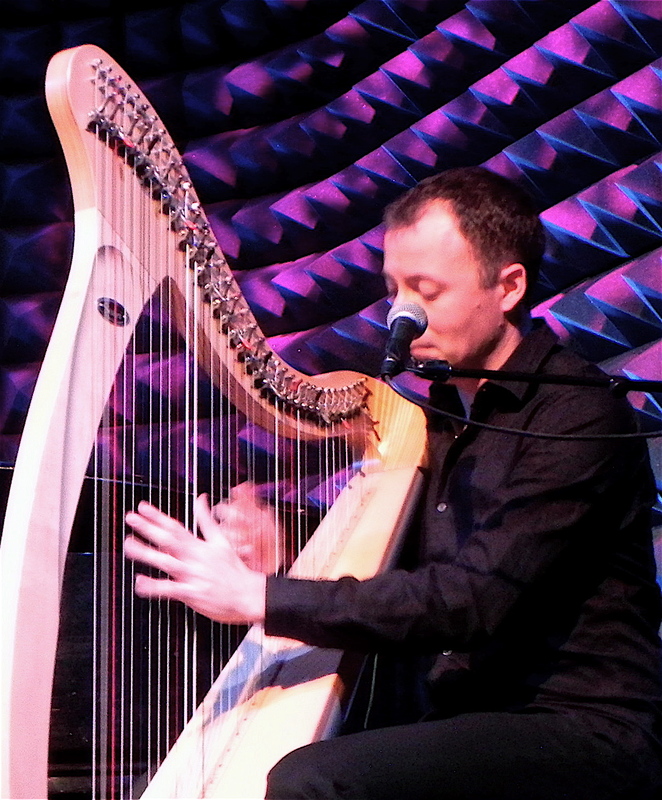 The singer was joined onstage Thursday night by her musical collaborator Cormac De Barra on harp, along with Megan Hunt on fiddle, Joe Pickett on mandola, John Hadfield on percussion, and Mike Cassedy on piano. On the opening number, Cassedy’s piano arpeggio set a meditative atmosphere while the harp and mandola played in perfect counterpoint, joined later by a soft driving beat and the low mournful swell of the fiddle. After the last wintry wisps of the first song died away, applause broke out. Wherever the songstress of this Celtic winter wanted to take us — from snowy lanes inspired by Thomas Hardy to 9th-century Irish carols — we were on board the caravan. The band provided a perfect accompaniment to the evening, from the bewitching madrigal “Banquet” to the quiet 3/4 lilt of “Fare Thee Well” (inspired by a Tennyson poem) to the jolly call and response of “Winter Jig.” “Winter Jig” also showcased the charming chemistry between Ashley and Cormac De Barra as the two alternated verses and grins. The harpist then took it away for a rousing 4-jig instrumental, followed by a stirring full band rendition of “Nollaig Moon.” Still, the highlight may have been the evening’s closer, a stripped-down “Raglan Road,” featuring Cormac on harp and Ashley on vocals. She added some gorgeous ornamental flourishes to the verses, a departure from her usual understated vocal delivery. It ended the evening on a note of emotion that was more urgent than wistful, and truly showcased the depth of this singer’s talent. As a performer, Ashley is not flashy yet commands the stage with a calm, riveting presence, interpreting occasionally with soft, ethereal gestures. My one complaint (and it’s a small one) was that I wished there had been no music stand in front of the singer to cut her off visually from her audience. While she didn’t rely on the stand (as far as I could tell, she hardly referenced it at all), it was a small obstruction that wouldn’t have been missed had she been able to do without. Musically, Ashley Davis has been compared with Loreena McKennitt, and the comparison is apt: both singers have a similar, haunting timbre to their voices, and both use traditional Irish instrumentation along with Middle Eastern influences. Add to that the seasonal theme of Ashley Davis’s Songs of the Celtic Winter, which calls to mind McKennitt’s 1994 album, To Drive the Cold Winter Away . It will be interesting to watch to see what Ashley does next. If this evening was any indication, she has a respect for tradition but an eye for innovation, and seems to have found her ideal musical partner in her work with Cormac De Barra. If you do have the opportunity to catch this singer live, do yourself a favor and get thee to the box office. In the meantime, it’s never too late (or too early) to do some Winter Solstice shopping for the Celtic music lover on your list. 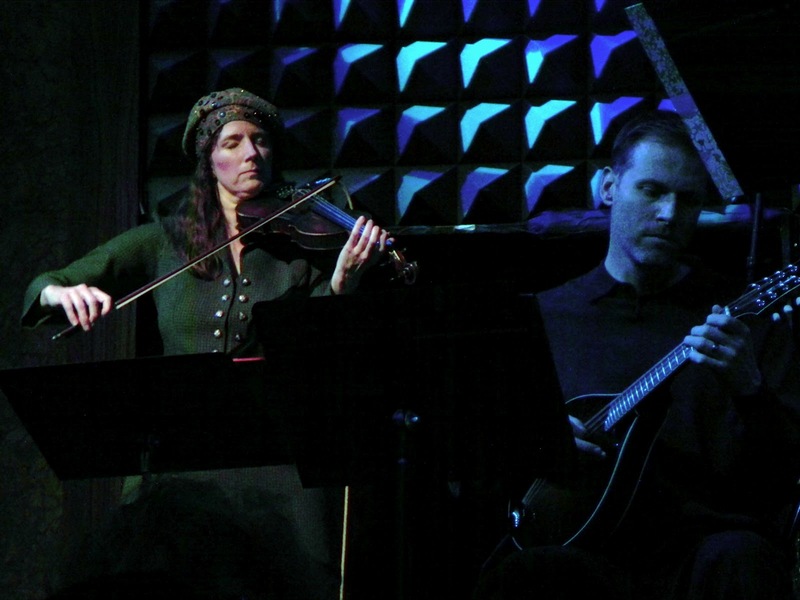 Or pick up her Songs of the Celtic Winter for yourself, then bundle up for an evening of poetry and lush Irish melodies that sound lovely all year round. You made a point that cannot be understated, Therese, when you described Ashley’s ability to weave a journey of song throughout the evening. 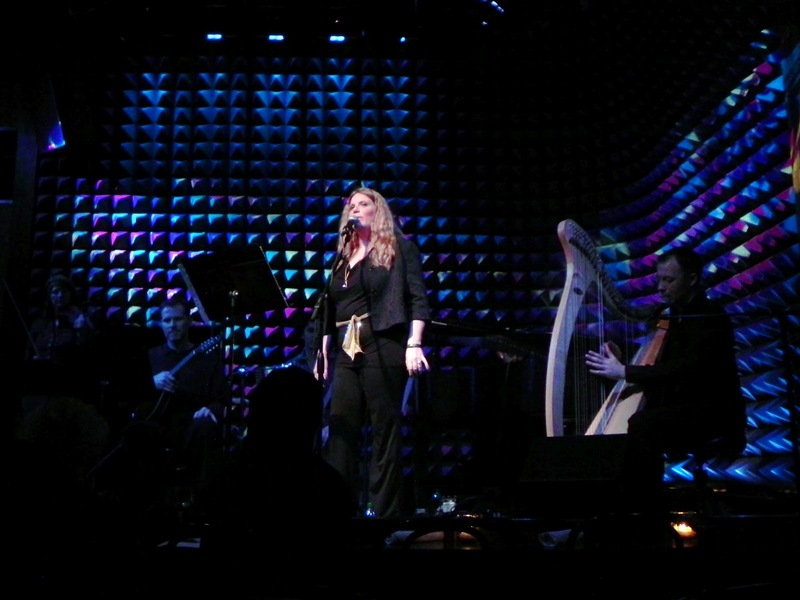 In my review on Truffles, Turtles & Tunes of Ashley’s January 17, 2008 performance at Joe’s Pub, I said “Entirely comfortable on stage, Ashley makes everyone in the audience feel like they are longtime friends. The introductions that precede each song guide her listeners on a smooth musical journey from beginning to end.” Granted, one must have a good voice and sing some good songs to make the musical journey work, and Ashley definitely measures up in those categories as well. Unfortunately, I missed the this particular concert, so I especially appreciate the detailed review. Having heard Ashley perform with Cormac de Barra on other occasions, I agree that the musical collaboration they have developed has enriched the textures of her songs. Sounds like it was a magical night! You missed a great concert, Linda! It was a great night for all.